I’ve always loved the concept of growing Achillea, or Yarrow, I was just never able to do it past my first laughable attempt early in my gardening career. 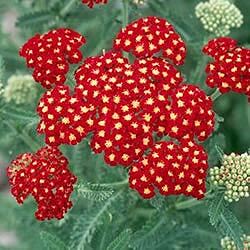 Yarrows are one of those “full sun” perennials that need every speck of full sun implied by the definition, and my semi-shady yard proved never suitable. My Yarrows always grew prostrate, a form of living mulch, by the end of June. But one joy of being a landscaper is that I get to besmirch other people’s yards, and get paid to do it to boot. So when planting perennial gardens I plant Yarrows, wherever there is sun. ‘Strawberry Seduction’ is a member of the recent Seduction™ series of Yarrows bred in the Netherlands. These are mid-sized (18-20” tall) plants with an equal spread. Fast-growers, this new series has introduced a prolonged bloom period (early summer to fall), good upright habit, and some very, well, seductive new bloom colors. The deep green foliage is lace-like, attractive and in good scale with the large button clusters of tiny flowers. In terms of garden use, yarrows are an old, old plant, and whereas it is a mainstay of the classic cottage and cutting garden, its semi-prairie appearance makes it great for large spaces. Large clusters of strawberry red flowers have a gold center, giving the appearance of a colorful, domed canopy. As flowers fade and die, they turn yellow and remain attractive. Other varieties in the series include ‘Saucy Seduction’ (rose pink), ‘Sunny Seduction’ (yellow) and ‘Peachy Selection’ (peach drifting dangerously toward orange, buyer beware). As stated, Yarrows need full sun and they ain’t a kidding. Six hours of direct sun minimum or there will be much diminishment of bloom and stature. Plants need decent drainage, but what else is new. They will not tolerate wet soils or over-watering— they like to get quite dry between waterings. They are fabulous for hot, dry climates. Deadheading will repeat bloom. This is an excellent flower for arrangements and drying. Yarrows in general attract butterflies and are deer and rabbit resistant (which means only it’s the last thing they’ll eat). Hardy to Zone 3.